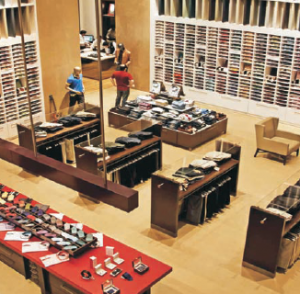 Raymond Ltd has some of the strongest brands in the apparel retail segment like Raymond, Made-to-Measure, Park Avenue, Parx, and ColorPlus. The company’s tagline, “The Complete Man. From Raymond” has been among the most influential brand campaigns and supported it well in maintaining brand equity and recall. The management’s strategy of focusing on each brand and creating a separate identity for each brand should lead to better inventory management. As per industry estimates, the clothing and apparel retail market is currently worth ~USD55bn. It is growing at 20-21% annually and is expected to be worth ~USD94bn by CY17. Modern retail is estimated to be 43% of this total market and expected to grow by a much higher growth rate. Growth is led by a surge in demand for readymade apparel in semi-urban areas, rising income levels, a young population and increasing preference for branded apparel. With distribution reach spanning over 1,000 stores (~20,000 touchpoints) in more than 380 cities in India, it is a perfect fit to ride the growth opportunities in the Indian branded apparel segment. Of the 797 TRS outlets, the management has planned to renovate the top ~30% stores over three years. The stores that have turned operational post renovation have shown ~15-17% higher growth over the past nine months. As of Mar-15, the management renovated 34 stores, and 11 stores are in the process of renovation. Its renewed focus on brand building, further leveraging of brand Raymond, focused retail expansion and revamping the whole consumer shopping experience would help it garner a higher share of the branded apparel market. Growth is led by a surge in demand for readymade apparel in semi-urban areas, rising income levels, a young population and increasing preference for branded apparel.